- Simply unzip into your custom UI folder. Once toggled on, the window should show up automatically in the future. - Updated to included Stacks counter. 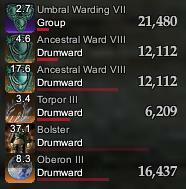 I use Profit UI for the sake of managing lag... And I want to use the Drums UI Spell Timer because I have really enjoyed it more than any others out there. So, I follow the instructions and modify my folders and XML accordingly but when I put in the command, it doesn't display. Am I missing something here? If you can't have it working, delete your ui folder and do a fresh install before installing this one. Just tried this, I couldn't get it to work. 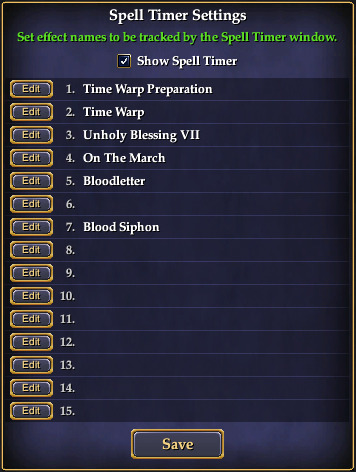 *Edit* The command to show the spell timer didn't work, but if I went to the UI button, I could select spell timer, then check show spell timer there. Last edited by Brrie : 04-16-2015 at 12:19 AM. Having the same POI issue as other and no matter what i do i cant seem to fix it hehe. I've not updated this single download in a while after I revamped my settings in the Updater & Manual Full UI Versions. I'm not sure how easy it would be for me to port it into this download, but when I have the time to do a patch I'll look into it. the edit button would bring up a POI creation for my Map rather than the spell timer edits. I verified everything was in the same place using my old Drums UI folder and finally tried reverting back to your old version you have listed. That works flawlessly. No idea why the new version is acting so wonky for me. 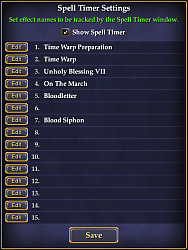 I'm happy using the old version as long as its compatible - I'm just happy to have my amazing spell timer window back, but thought you would like to know! I'm having some trouble with the updater version. It has disappeared and reappeared several times now apparently of it's own accord. Which part are you having trouble with. Did you use the command above to get the window to show up to toggle it on? This standalone version hasn't been updated in a while but should still work. The one in the Updater version is a bit different now, so it would take some more time to split out. Not via the UI customization. Would have to feedback it to SOE. Last edited by Money : 05-25-2014 at 03:02 PM. I "think" I updated correctly and the warlock prestige "Toxic Aura" is not showing any increments at all in the spell window. 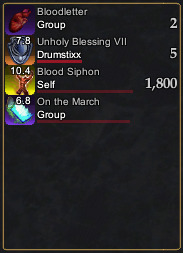 I use separate add-ons and pretty much have most of the pieces of drums. Any idea why this is?. Any idea why Illusionists' Prismatic Chaos doesn't show up? It is definitely in the default maintained window but not in yours? Others that don't show are any sort of DoTs it seems (Nightmare, Chromatic Shower etc) Is this normal? Bah just figured it out. I wasn't putting the numbers behind the spell names.